This Greek vegan pie recipe is make without cheese and is thus a variation of the popular version with cheese. It's the perfect alternative to make during lent (lenten recipes). 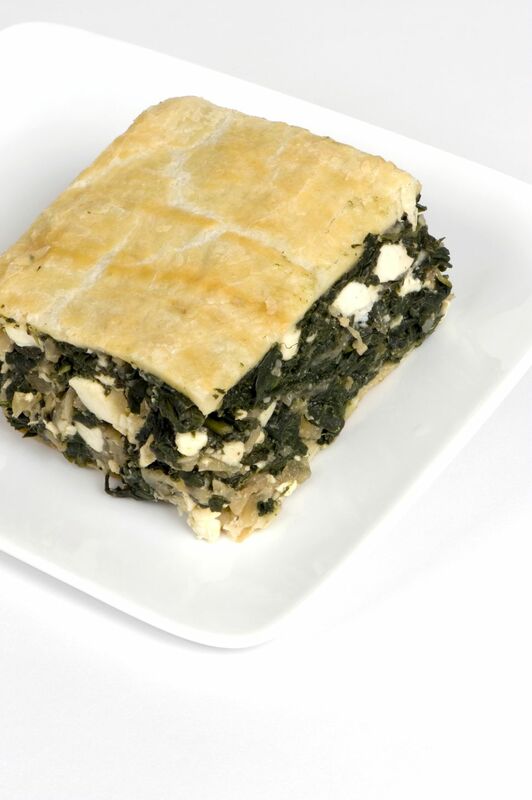 Although the name for this dish is often used for the spinach pie with cheese, traditional spanakopita does not include cheese. For a taste treat, use mixed greens such as spinach, collard greens, mustard greens, kale, etc. Enjoy this Greek vegan recipe! Wash the spinach (and other greens, if using) well in cold water, removing roots and damaged leaves. Chop coarsely and place in a colander. Salt lightly and let drain for 10 minutes. Press or squeeze to remove all excess liquid. In a large mixing bowl, combine spinach (and greens), dill, parsley, onions, fennel, pepper, and half the oil, and mix well until ingredients are well blended. Brush the pan with oil (it can be round, square, or rectangular). When laying the sheets in the pan, leave an overlap of phyllo outside the pan rim all the way around. Lay half the phyllo sheets on the bottom, brushing each one lightly with olive oil. Spoon in the spinach mixture and spread evenly. Fold the extending phyllo in over the mixture. Lay the remaining phyllo sheets on top, brushing each with oil except the top sheet. Trim the top phyllo with a scissors, and score the top into serving-size squares. Brush the top with oil. Wet your hands and shake off the excess water over the top of the pita. Bake at 350°F (175°C) for 1 hour on the rack just below the middle of the oven. When done, remove from the oven and allow to cool 1/2 hour before serving. Serving suggestions: This can be served as an appetizer, side dish or snack, or as a main dish served with a salad and crusty bread. Party Suggestion: The above quantity can be made in two (2) round 9-inch springform pans. Use 1/2 pound of phyllo for each, laying the sheets over the bottom and out the sides. Add the filling, fold the extending pieces in to the center to cover, tucking in where needed. Oil the top of the pie, cut into pie-shaped pieces, and bake at 350°F (175°C) for about 35 to 40 minutes, until the top is golden and the phyllo pulls in from the side of the pan.